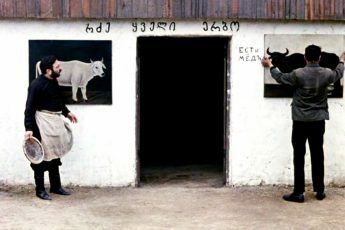 Concerning Otar Iosseliani’s debut feature film about corrupt wine producers, Falling Leaves (1966), Konstanty Kuzma points out that the “simplistic contrast” of idyllic, traditional country life versus collectivized agriculture “belies the complexity that hides behind the larger narrative.” Any critic of Iosseliani’s earlier short, April, must take to heart this caveat. On its own, the narrative of April is unabashedly simple, its symbols far from obscure. But the film’s style and a few ambiguous details point to the development of a cinematic consciousness capable of more than one-to-one metaphors. 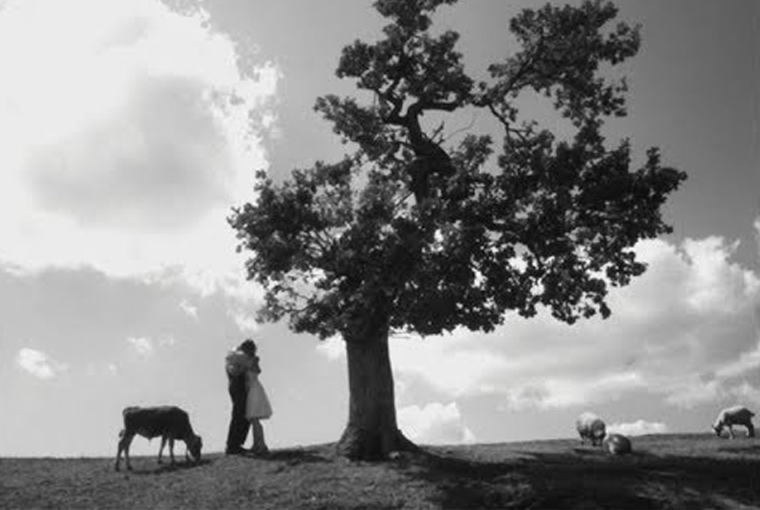 A young couple seeks a good place to share a kiss and find it in a field under a massive oak. Nonetheless, when we next see them, they are moving into a flat of their own. Their kisses light up the lamps, turn on the faucet and fire the gas stove. In this fantasy world, one can live on love alone. Even more ideal, their neighbors across the courtyard are musicians and dancers; framed in their square windows, they seem to embody art and grace, pirouetting and playing in near-empty rooms. Trouble arrives with a clattering host of new tenants carrying furniture and other encumbrances. Among them is a diminutive man who inspects each household through the keyholes. 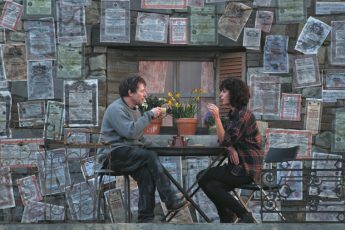 Using the language of gesture that prevails throughout the film (the only dialogue is in a fairly convincing invented language), he conveys to the young couple that they ought to fill their bare apartment with furniture. Soon afterwards, he gives them a chair. From then on, the lovers seem doomed, filling their small space with a labyrinth of nonsensically oriented beds, couches, shelves, drawers, and appliances. They accept the little man’s offer of a padlock for their door; soon one lock is joined by six others. Their love fades. Their kisses no longer turn on the faucets or the lights. It takes the intervention of the artists, and decisive anti-materialist action on the part of the couple, to restore the earlier idyll. The satire, though gentle, is so evident that one feels most intrigued by the ambiguities it leaves scattered about. On the one hand, it’s not entirely clear what the strange interloper represents, if anything. It’s impossible to tell if his gift is inspired by misguided generosity or the more sinister objective of enforcing conformity. Furthermore, the flat’s magic response to the lovers’ elans of affection verges on the parodic, as does the dire chain reaction of accepting even one item of furniture into one’s home. It’s difficult to tell exactly where the film positions itself; though clearly anti-bourgeois, it nonetheless conflates the magic of young love with the ingenuities of modern convenience. The most satisfying way to watch April is perhaps as a kind of cine-ballet with a neat formal logic. In their happy moments, when the couple is unencumbered, the camera pans with them calmly and smoothly, framing them low on the horizon before a vast sky. As they become entrapped in the flat, the camera becomes jerky and frenetic, executing near-subliminal zooms and jerks that make it seem as though space itself is being attacked. 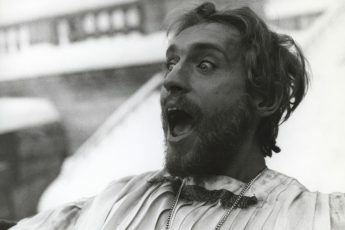 The use of sound changes, as well; when the lovers, dressed in light-colored clothes, glide through the city streets or over the field, traditional Georgian music lilts; in the flat, the sound effects are loud, discordant and absurd (the diminutive man’s reproving shake of the finger clangs like an unpleasant bell, a table fan drones like a nearby airplane). The actors convey these changes as well, playing with subtle jokes, such as the young woman scrubbing down a table and obliviously continuing on to her man’s bent back. The most touching scene is a mise-en-scene of their reconciliation, as the lovers shift restlessly over the furniture they have amassed, unable to get comfortable, to distance themselves or to get too close to one another. Their faces express regret, exasperation and loneliness even as their bodies seem to gravitate together. April can be compared to later communal-living surrealist dramas from other Socialist states: the grotesque claustrophobia of Jan Svankmajer’s A Quiet Week in the House and The Flat comes to mind, as does Zbigniew Rybczinski’s animation Tango. Though far less sinister, and at times genuinely eloquent in depicting love and hurt, April’s strangeness creates a distancing effect from its characters and casts doubt on the transparency of its message. A fitting debut for a director who would reveal himself adept at seamless contradictions.